With the advancements of our society, business cards just aren't for businesses anymore. So many of us are bloggers, participate in extra curricular events for our children or ourselves or a host of other reasons which makes business cards a nice must have at the end of the day. 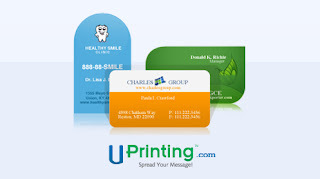 UPrinting.com business cards are a perfect way to convey who you are, what you do or your own business. Having our own non-profit is one reason why I use business cards and can think of so many other cool reasons such as an upcoming party, contact information since I have so many hobbies or even notification of when I move which I do so frequently. *Disclosure: You should assume that I will receive free print products in exchange for the post. Any and all reviews posted are based solely on my own experience and may be atypical. Please practice due diligence in making any related purchase decisions. Interested to hold a giveaway like this? Please sign up here.